Strong, powerful and imposing… a Dogue De Bordeaux is a dog with a substance. Their powerful aura is pawfectly complemented with a harmonious temperament. One of the most ancient purebred dog, Dogue De Bordeaux (DDB) or the French Mastiff is also popularly known as the ‘National Guard Dog of France.’ Massive and powerful, this dog is a good companion dog…with natural instincts to guard and protect, besides being a responsible and friendly family member. The characteristics that distinct a Dogue De Bordeaux apart are his head, expressions, wrinkles and his trotting, which resembles the trot of a lion. The DDB’s massive head is one of the striking features of the breed. When viewed from above and the front, the shape of the head is a trapezoid. Their eyes are oval and set wide, and are hazel or dark brown. Wrinkles are symmetrical and change intensity and proportion as the face expressions change. It is important to note that puppies and youth go through a period where the head is changing and wrinkles may be absent. They have a muscular body and their coat is soft and thin to the touch. The length of the body of DDB is slightly greater than the height at the withers. The muzzle is broad, thick and short. DDBs are found in three colour variations – black mask, brown mask and no mask. In the Black mask, the mask is often only slightly spread out and must not invade the cranial region. There may be slight black shading on the skull, ears, neck and top of the body and the nose is black. In the Brown mask (used to be called red or bistre), the nose and eye rims are brown. In no mask, the coat is fawn: the skin appears red (also formerly called “red mask”) and the nose is reddish or pink. The males weigh around 50 kg while the females weigh around 45 kg. Their average height is 23.5-27 inches for males and 22.5-25.5 inches for females. The Bordeaux has a good and calm temperament. He is extremely loyal, patient and devoted to his family. Fearless and confrontational with strangers, he is a great watch and guard dog. He socializes very well with other animals, preferably start from an early age to avoid them being aggressive with other dogs. The Dogue de Bordeaux snores and drools. 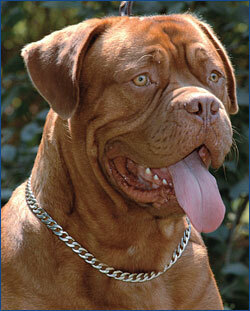 Despite his appearance, the Dogue de Bordeaux is gentle with children and family members. In fact, they are a stress buster for children and are highly playful and caring with them. Deworming should be done once a month for the first 6 months and then every 2-3 months. One should be careful not to make the puppy heavy. This should be done after an age of 10 months. Play and exercise by themselves is a must and they should get ample space to run. This is a powerful pooch and is not suitable for an inexperienced dog parent. The objective in training this dog is to achieve a pack leader status. It is a natural instinct for a dog to have an order in their pack. When we humans live with dogs, we become their pack. The entire pack cooperates under a single leader. Lines are clearly defined and rules are set. You and all other humans MUST be higher up in the order than the dog. That is the only way your relationship can be a success. This breed needs a calm but firm parent who displays a natural authority over the dog, one who is confident and consistent. Diet plays a very important role in the life of Bordeaux. Research has shown lifespan being linked to diet. DDB needs little grooming and they are average shedders. DDB needs a lot of exercise as the lack of mental and physical exercise can develop behaviour problems. They need to be taken on a daily long walk. Fetching and swimming are the best games the Bordeaux loves. They are excellent swimmers and simply love water. Most are healthy, but the breed can be prone to hip dysplasia. There are also cases of epilepsy, heart problems and hyperkeratosis. These are highly active dogs, hence space requirement is a MUST. We would never suggest you to get a Bordeaux if you cannot spare time for the dog. They need very good diet and always get a puppy from a reliable source/breeder.